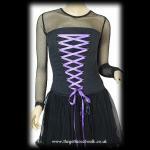 A gothic punk bodice top from Phaze made from cotton-lined black lace with a shaped bust area, lace edged sweetheart neckline and decorative buckles at the centre front. The back has a full length zip fastening and the double shoulder straps are adjustable. Bust: 34" Waist: 30" Length from underarm: 14"
Bust: 36" Waist: 32" Length from underarm: 14"
Bust: 38" Waist: 34" Length from underarm: 14"
Bust: 40" Waist: 36" Length from underarm: 15"